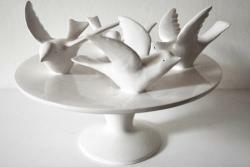 I would like to receive occasional information and updates from Poly Pottery Silent Auction and jumblebee. 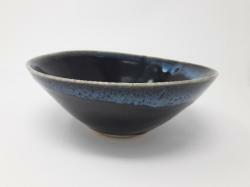 Welcome to our charity art and ceramics auction of work from well known Cornish artists and ceramicists like John Howard, Paula Downing, Tim Lake, Michel Francois, Jane Smith, Sue Davis, Dot Serle, Karl Owen, Peter Webster and lots more. 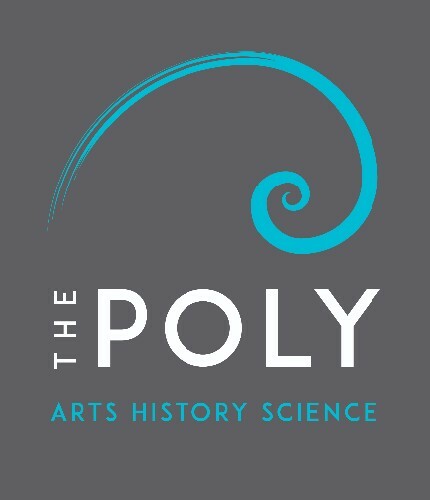 The Royal Cornwall Polytechnic Society has had its home in our iconic building in the heart of Falmouth since 1836. We have been at the centre of many innovations and remain true to our original purpose - the pursuit of the inventive arts. Why are we holding this auction? We are in the process of setting up Falmouth's Community Pottery here at The Poly. 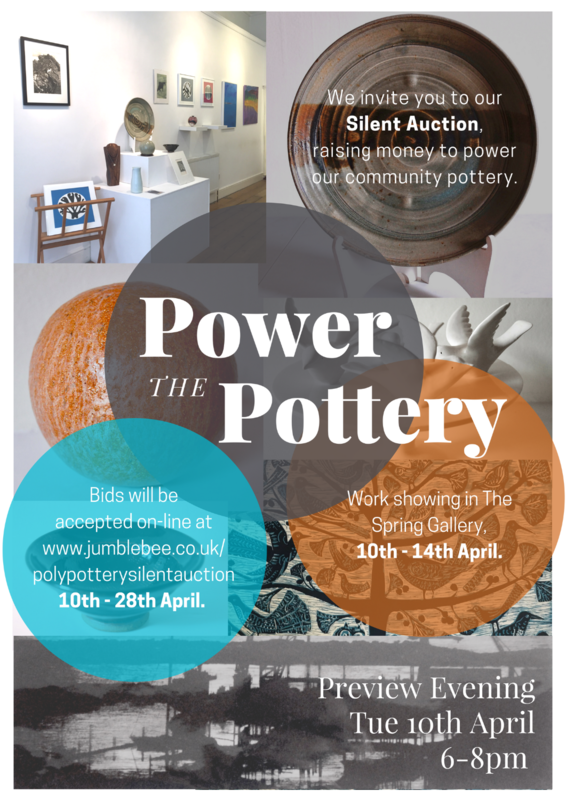 The pottery will offer studio space for 5 Potters, a kiln firing service, community courses, and pottery tuition.We have the building, kilns, wheels, equipment, pottery manager, but no electric supply so this final £3,500 is to bring power to the pottery and help continue the Falmouth ceramics tradition. Any art that does not reach its reserve will be returned to the artist. Postage and packing extra by arrangement with the Poly Guild and Galleries Manager. 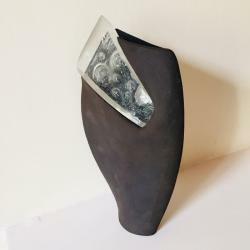 Descriptions of work are as accurate as possible and we have listed artist and maker websites for you to discover more about the artists. Shoreline by Dot Searle. 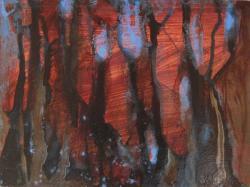 Oil on Card. Oil on card, framed in a white birch frame. Dot completed her BA (Hons) at Falmouth College of Art in 1992. On a postgraduate trip to Cyprus in 1994 her interest came alive in the viewing of walls, textures and topographical spaces which left her with impressions of fading murals in sacred places such as churches and monasteries. 'Since then I have used painting and sculpture as a personal commentary on life' as the ravages of time and human conflict come together in her pieces of work. 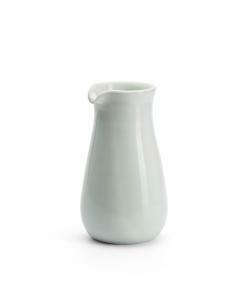 Stunning porcelain wine carafe by Michel Francois. 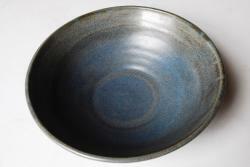 Michel graduated from Falmouth University in 2002, then was an artist in residence at the Leach Pottery, St Ives. Following from this, he set up his own studio outside Helston. Recent projects include co-designing and producing a new range of tableware for the Eden project. This was facilitated with the aid of a research grant from AIR (Academy of Innovation and Research). His work has been shown in Paris (Gallery Art Présent), London (Gallery 43 Mayfair), Edinburgh and Taipei (International Teabowl Exhibition). 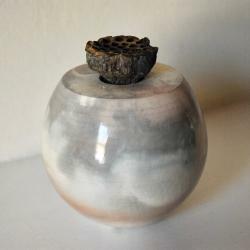 I make a variety of forms, ranging from vases and lidded containers to drinking cups and pouring bowls. All work is stoneware and is thrown and turned on a slow turning kick wheel and fired to between 1280°C–1300°C in a gas kiln. 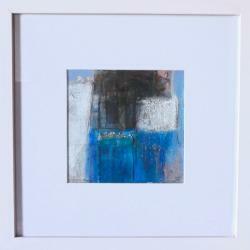 Image Size 30cm x 30cm; Framed 40cm x 40cm Framed in white metal frame and signed and numbered on the reverse of print. Part of a series of hand pulled screen-prints based upon algae, ferns, seeds and lichen that abound in Cornwall. 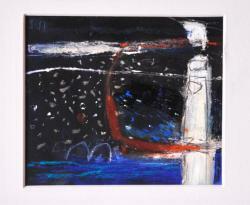 From Jane Howard an exquisite oil on boxed panel. 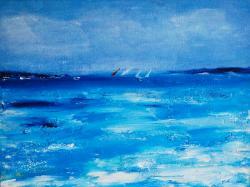 My Landscapes and seascapes are influenced by the local environment here in Cornwall. I like to go walking and make sketches in pencil and charcoal and sometimes in watercolour. 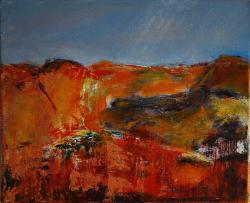 I’m drawn to the unusual and challenging aspects of the Cornish landscape, the energy and dynamics it has. I take the sketches back to the studio to work from. I’ve recently been working on some large Indian ink paintings using the sketches as a guide/inspiration and I hope to develop these further into oil paintings. A beautiful necklace from a local jewellery designer. 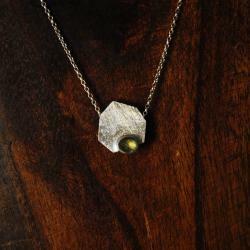 The unusual hex and prehnite design sits on a 20 inch chain. 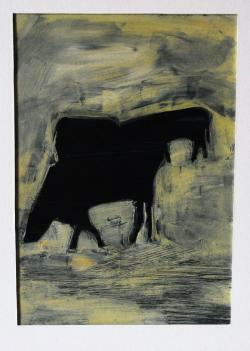 My current work has been inspired by the research I was doing in the old clay pits around St Austell last year. I collected China clay samples along with various plants, feathers, dried dead moss and manmade materials such as wire and waste materials found on walks in and around Blackpool pit. 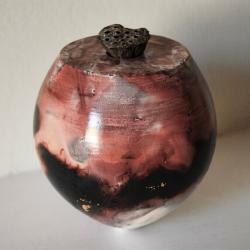 I blended the China clay collected into a porcelain and produced a limited range of small thrown vessels on the wheel. They were then highly burnished to produce a glass like surface. Three were sagger fired using dried moss, grasses and heather. Giving beautiful subtle greys and blacks, with a pink and orange hues. 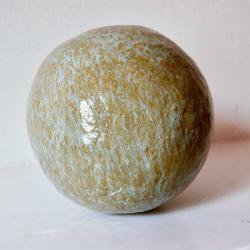 The second batch were treated with Ferric Chloride and fired using heather,feathers and moss. 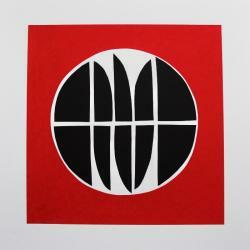 Creating a surface which is unique each time, in reds and tones of grey and black. The shadows of the heather flowers, feather and moss are clear on the surfaces creating an interesting range of patterning. The materials and processes I use are really important and relate back to growing up in the Midlands with the surrounding influence of industry and making. 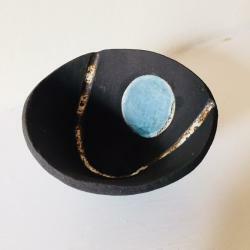 A key element of my work emphasises the importance of balance and harmony, both aesthetically and physically and I enjoy combining the materials and techniques of glass and ceramics to create pieces that emphasise the importance of this balance. My work is now heavily influenced by the dynamic landscape of Cornwall and my passion for the patterns formed in the natural and man-made environment. Printed on Fabriano paper , cellophane wrapped and could be flat packed anywhere in the UK. 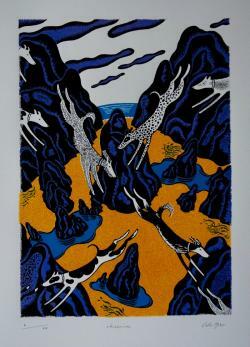 Image Size: 26cm x 38xcm Paper Size 38cm x 56cm edition of 25. Having spent three decades of his professional career in Cornwall lecturing, guiding and encouraging his degree students to develop their work, Simon is now delighted to be practicing what he preached and creating his own work. With an eye for detail, a head for solving problems, an incredibly steady hand and never ending patience he explores his materials and works to develop and produce work of simplicity and beauty. 'Since then I have used painting and sculpture as a personal commentary on life' as the ravages of time and human conflict come together in her pieces of work.. Image size 30cm x 30cm; paper size 40cm x 40cm. Flat packed and cellophane wrapped - can be posted anywhere in the UK. Rock Form of North Cornwall Coast. Slab built ceramic form. 11cm. wide. 20cm tall. 6cm deep. 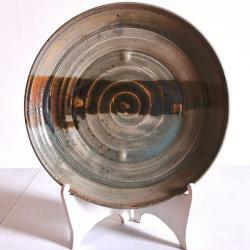 Two stunning hand built from grogged stoneware clay, glazed and high fired; 15 cm diameter. by Anthony Fagin Retail value £75 each.Can be suspended. If interested in both moons, please contact the administrator for a joint price. Photograph (printed on Hahnemuhle Fine Art Premium Paper) in oak frame. Claire lives and works in Falmouth. 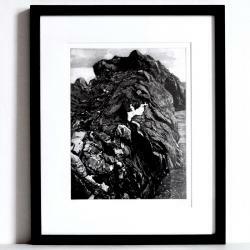 She is a photographic artist inspired by Cornwall’s natural beauty and traditional industries. 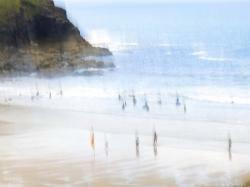 This limited edition work is from a series called “Beach Figures” created using a photographic technique called Intentional Camera Movement (ICM) where the camera is intentionally moved as the shutter is released to create blurs, layers and textures in the final image. The image was captured at Poldhu on the Lizard in Cornwall in July 2017. Mixed Media on canvas. Narrow white frame. 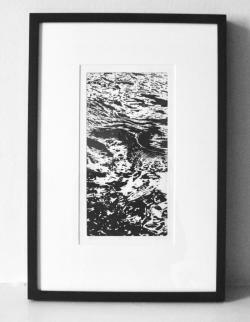 Size: 32cm x 24cm Framed in black birch. John was elected a Fellow of the Royal Society of Painter-Printmakers (RE) in 1995 and a Member of the Royal Birmingham Society of Artists (RBSA) in 1996. 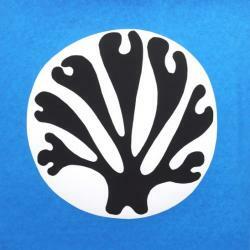 John runs the John Howard Print Studio in Penryn and teaches at University College Falmouth. John’s early work drew heavily on his experiences in industry, with a series of prints and drawings based on his work in Birmingham and Black Country foundries, evoking the dramatic lighting effects created by blast furnaces in the dark and sombre interiors. His work then focused on architectural themes, exploring relationships between space, structure and light, both internal and external. Since moving to Cornwall John has been able to develop his interest in discovering unusual and different perspectives on the natural environment. His particular expertise is in exploiting the qualities of light and experimenting with form and structure, both natural and man-made. 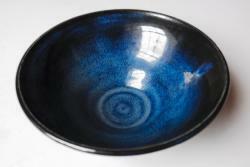 A chance to own a piece of highly collectable, limited edition ceramics from Karl Owen (only 20 pieces in the collection. 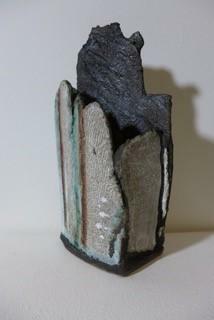 This piece is Ferric Chloride and was fired in heather and moss. Karl's current work has been inspired by research he in the old clay pits around St Austell last year.After collecting china clay samples along with various plants, feathers, dried dead moss and manmade materials such as wire and waste materials found on walks in and around Blackpool pit he blended the China clay into a porcelain and produced a limited range of small thrown vessels on the wheel. They were then highly burnished to produce a glass like surface. 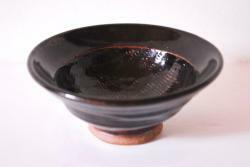 Stunning black and porcelain clay with glass work. Image Size: 30cm x 30cm; Paper size: 40cm x 40cm. sined and numbere4d on reverse. Flat packed and cellophane wrapped- can be posted anywhere in the UK. Hand pulled screen-print based upon algae, ferns, seeds and lichen that abound in Cornwall. 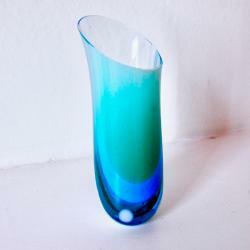 Kiln Formed Glass Vase by local maker, Helen Eastham. 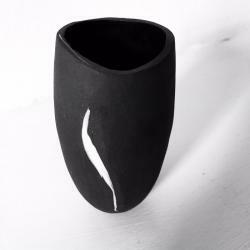 Will look gorgeous filled with a spring posy or equally elegant as a statement piece on show. Framed in a white metal frame. Signed and editioned on reverse. 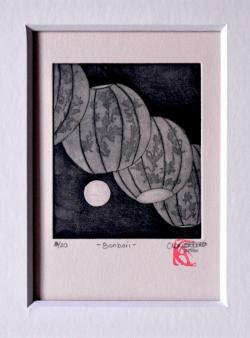 Bonbori are a type of paper lantern traditionally used in festivals. They either hang on wire or from a pole. Cellophane wrapped flat for postage across the UK. 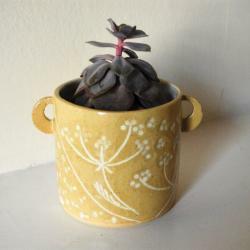 Gorgeous ceramic glazed planter by Julia Crimmen. I create detailed etchings that express the tension and fragility I observe where water, land and rock coincide, be this in a mountain stream, off the Cornish coast or beneath Arctic cliffs. 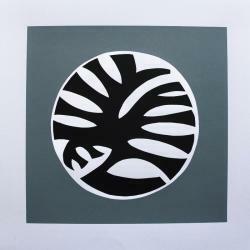 John runs the John Howard Print Studios in Penryn in an iconic eco-building, offering courses, workshops and open access to other printmakers and is a lecturer at Falmouth University. 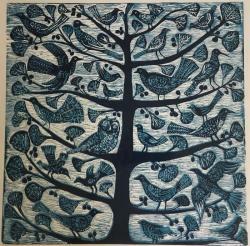 Tregony Tree, by Amy Cooper. Porcelain. 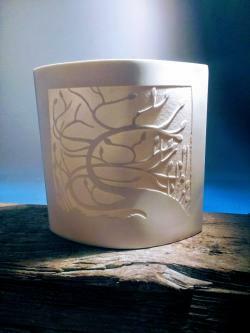 Slipcast and sandblasted porcelain tea light holder or vase. An atmospheric painting by Vicki Clark. This is a stunning original print by local artist Felix Packer. Felix is a craftsman and artist who works from his studio in Falmouth, Cornwall, England. You can find his work dotted across Cornwall and further afield, from the Eden Project to the homes of art lovers nationwide and beyond. 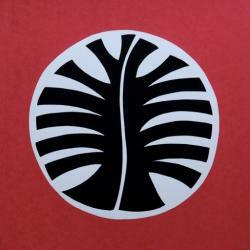 Felix specialises in wood and lino cuts, with prints ranging from 10 x 10cm to 1.6 x 2 metres. 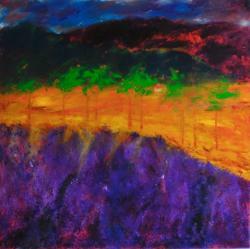 He also works in a variety of other media such as pen&ink, acrylic, oil, gouache and mixed media. 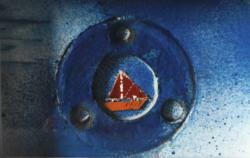 He is also becoming well known for his sculptures in wood and beautiful mosaics. After many years of carving furniture and sculpting in wood, he now attracts commissions for larger works in both private and public settings. I make contemporary maritime art, combining the process of photo silkscreen with painting and found materials taken from the landscape, notably my walks along the Peryn river. The boats included in the constructed paintings often resemble traditional working boats as I try to connect some historical context with a more modern practice. 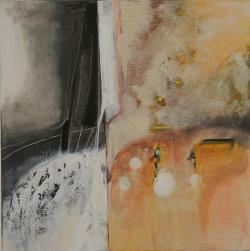 Mixed Media work on Canvas by renowned local artist Sue Davis. I have made a conscious decision to work on abstraction as it releases me from considerations of myth, history, politics, aesthetics, morality, religion or recognition. 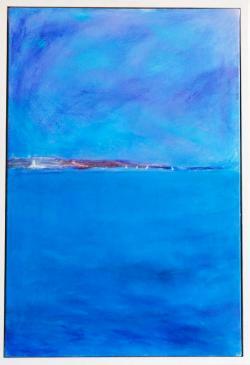 It is my belief that abstraction comes from the subconscious mind which is fuelled by the events and visions of the day. Visual awareness is important but it is the dessicated fragments of light when it touches a surface - translucent, moving or static that is of interest, not how it forms an object. To think in this detached way opens new vistas of speculation and this is the reason I work experimentally with mixed media. The outcome of different materials can be unexpected and unpredictable. Experience with this manipulation, coupled with ones sensitivity which is gained over time, enables balanced decisions about the images. Phase 5 by Peter Webster. Pencil and Ink. Graphite and ink on archival paper. Original drawing , float mounted and framed in a white birch frame. 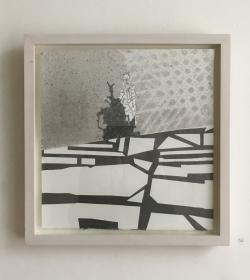 Part of a series of 5 works exhibited in the RWA exhibition in 2009, and donated by the artists from his personal collection. 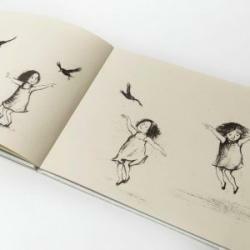 The beautiful illustrated, signed, limited edition book telling the tale of little Florence and her adventure.